The annual hop picking day at Red Hill's brewery on the Mornington Peninsula is something of a Victorian beer industry tradition, with friends and beer lovers heading along for a sticky day of picking followed by a few refreshing beers. This year saw them pull what was apparently a bumper crop from their handful of bines, with many of the hop cones added to the latest version of their annual Hop Harvest Ale. 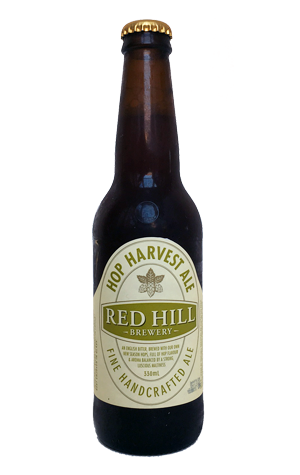 In keeping with the Old World inspirations behind their brewery, Red Hill grows hop varieties of a different ilk to those Hop Products Australia and Ellerslie Hop supply to many of those creating harvest beers around Australia. Among them are some old school varieties and, as such, their harvest ale takes the form of an English style bitter, with Fuggles derivative Willamette and classic English variety Goldings added at various stages through the brew. Given its heritage, it's a beer best enjoyed from the handpump at the brewery itself, but if you want to try a rather different fresh hop beer to most on the market you can find it in bottles and on tap elsewhere. If you do, you can expect to find some marmalade and earthy aromas climbing from its malty brown body, with an earthy, spicy bitterness building up behind the chocolatey, bready, doughy malts.